On Saturday, my husband and I headed off for dinner in Glasgow. After missing out on seeing Professor Maggie Cusack’s Exhibition at the Hunterain after the Scottish Parliament & Universities KE Seminar in April (the Hunterian is closed on a Monday) we thought what better way to avoid the football traffic (and more necessarily, the shops!) but to visit Shell Meets Bone before our dinner. 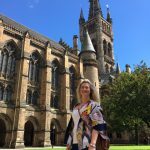 Now, I’m particularly biased to the Stirling campus, having been fortunate enough to enjoy it both as a student & as a member of staff, it’s green, open spaces inspire me on a daily basis but I must say the University of Glasgow campus knocked our socks off! The piercing blue that split the sky, the architectural beauty and silent whispering of academic activity really took my breath away and (sorry guys) made me think, ‘you could work here everyday’*. 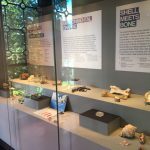 We headed into the Hunterian Museum for Maggie’s Shell Meets Bone exhibition. Having never been to the Hunterian before, we enjoyed the other exhibitions and fascinating roof that covered the fossils, coral and giant skeleton (Did you know that the oldest Shark fossil, some 330 MILLION years was found in Bearsden and is the most pristine fossil of its kind allowing even the Shark’s last meal to be determined!) before excitedly (and proudly) heading into the exhibition that brought us here. Shell Meets Bone is split in two: In no particular order other than the way I visited the exhibition, downstairs is Rachel Duckhouse’s artistic representation of the minerals that grow into shells, while upstairs in the science showcase is the second part that talks about the science behind the phenomenon. What was great about both exhibitions was the accessibility – Sandy (my husband) won’t mind me saying that this isn’t really his thing and that he was playing the dutiful husband role before dinner, but even he agreed that the exhibition provoked thought and emotion and that he enjoyed how the science wasn’t thrust in front of him. In Rachel’s artistic exhibition her digital copies of her sketch book were fascinating as they demonstrated the intricacies of the minerals, the shell architecture and the process of thought she and Maggie went through as they explored how the mother of pearl shell can stimulate human stem cells to make bone. Upstairs in the Science exhibition, Maggie has lent a number of shells to the exhibition that tell the story of how shell induces bone formation, a fact discovered and used effectively by the Mayan people whilst conveying important information about the dangers associated with environmental change. 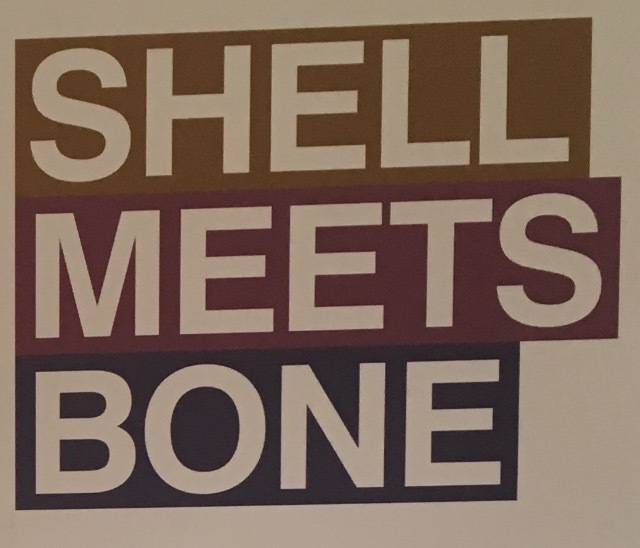 As our tummies began to rumble, we walked alongside Kelvingrove park to dinner, discussing how useful exhibitions like Shell Meets Bone are to convey research to people (like Sandy) who aren’t in amidst it every day or necessarily looking for it. 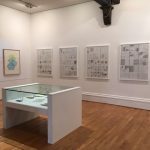 The exhibition opened up lots of questions for me and gave me something to google further on the train home – it also got my creative juices going as I thought wildly about ways we could bring exhibitions like this to Stirling. 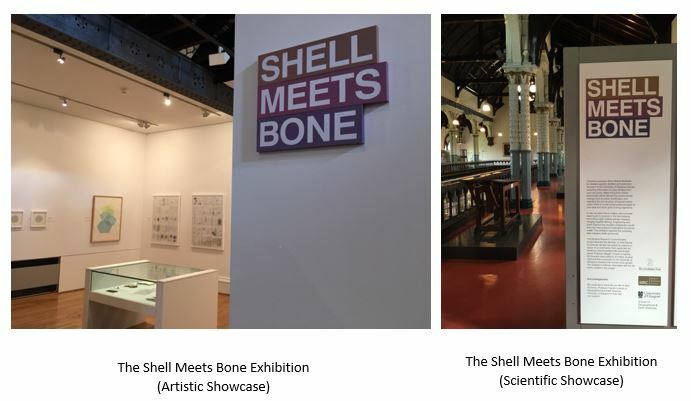 I’d encourage anyone local or fancying a day out to visit Shell meets Bone, not least to support Maggie’s research but mostly to enjoy research in alternative forms and the other exhibitions available at the Hunterian. *Don’t worry RIS I have no plans to move – there is still plenty of inspiration to be had from the Stirling campus!